DJ PABLO 77 brings a stolen armored car full of vinyl. AARON J BOLAND, ATTORNEY, sponsors gratis drinks (while they last). THE UNDERGROUND runs a four-fisted, chainsaw-juggling, death-defying cash bar. RESTAURANT WEEK participants Andiamo!, La Casa Sena and Luminaria (Inn at Loretto) dish the delectables. JOE DEAN and JON MORITSUGU infiltrate brains by bending light and space. INDOOR FIREWORKS ARE not PROMISED, but that doesn’t mean they won’t be there. TELL US the most creative, entrepreneurial use for $200 and we just might give it to you on the spot. THAT’S RIGHT: It can only be time to MIX again. 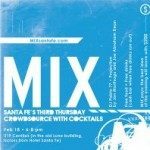 This third Thursday we recap the $%&@ing problems with Santa Fe that were identified last month and we launch an ambitious contest to move toward MIX FIXing the most pressing issues. From here on out, it PAYS to MIX.